March 26, 2015 -Second Semi Final: Australia 328 for 7 beat India 233 by 95 runs. March 24, 2015 -First Semi Final: New Zealand 299 for 6 beat South Africa 281/5 by 4 wickets. March 21, 2015 -Fourth Quarter Final: New Zealand 393/6 beat West Indies 250 by 143 runs. March 20, 2015 -Third Quarter Final: Australia 216/4 beat Pakistan 213 by 6 wickets. March 19, 2015 -Second Quarter Final: India 302/6 beat Bangladesh 193 by 109 runs. March 18, 2015 -First Quarter Final: South Africa 134/1 Sri Lanka 133 by 9 wickets. 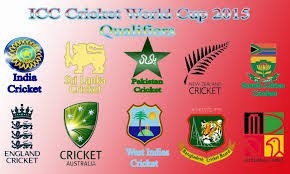 14 Nations are participating in ICC Cricket World Cup 2015, Which is being held at various venues across Australia and New Zealand. The teams are divided into Pool A and Pool B. First Match was played between New Zealand and Sri Lanka at Christchurch on February 14, 2015. Final match will be played at Melbourne on March 29, 2015. New Zealand started their world cup race with a huge victory over Sri lanka. NZ batted first and scored a massive total of 331 runs for the loss of 6 wickets in 50 overs. Contributions to the score are like this: Anderson 75, McCullum 65, Williamson 57. In reply Sri Lanka could score only 233 runs and they were all out in 46.1 overs. 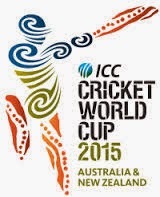 First day of ICC cricket world cup witnessed massive wins by 2 strong teams. In first match New zealand was the star. Now it's Australia. Ausies trashed England by beating them for 111 runs. Australia batted first and score a grand total of 342 runs for the loss of 9 wickets in 50 overs. Finch scored a ton, other contributions are Maxwell 66 and Bailey 55. IN reply England were bowled out for 231 runs in 41.5 overs, leaving Australia victorious. This was an exciting game lots of runs were scored. South africa batted first and scored a gaint toal of 339 from 50 overs for the loss of just 4 wickets. Miller and Duminy scored centuries for SA. In reply Zimbabwe could score 277 and were all out in 48.2 overs. For them Masakadza and Chibhabha scored half centuries. Arch rivals India and Pakistan met again and this time also victory was with India. This was the cricket game which was viewed by millions of viewers across the globe. In the game India batted first and scored a pretty decent score of 300 for the loss of 7 wickets in 50 overs. Pak bowler Sohail did an amazing bowling spell and took 5 indian wickets for 55 runs. Kohli scored a ton. Raina and Dhawan scored half centuries. In reply Pakistan collapsed for 224 runs in 47 overs. Misbah scored 76. "Fall of the gaint", this is what that comes to mind when thinks about this game. In first 4 matches of this world cup, the team who batted first had won and now it had changed. The mighty west indies scored a massive 304 total on board for there weak opponents Ireland. WI scored 304 runs in 50 overs for the lose of 7 wickets. Simmons scored a ton and sammy scored 89. In reply to this Irish men batted courageously and scored 307 in 45.5 overs with a loss of only 6 wickets. Stirling, Joyce and O'Brien scored more than 50 runs. Scots batted first and scored 142 runs. they were all out in 36.2 overs. In reply NZ just won the match by scoring 146 runs in 24.5 overs for the lose of 7 wickets. Bangladesh bat first and scored a huge score of 267 runs in 50 overs . They losed all their wickets. Mushfiqur and Shakib batted well. Inexperienced Aghans in reply could score only 162. They were all out in 42.5 overs. UAE batted first scoring a sound target for Zimbabwe of 285 runs in 50 overs for the loss of 7 wickets. In reply Zimbabwe batted courageously scoring 286 in 48 overs for the loss of 6 wickets. Point to note is the improvement of UAE in both batting and bowling. England batted first and were all out for mere total of 123 runs in 33.2 overs. In reply New Zealand quickly scored 125 in just 12.2 overs for the loss of 2 wickets (McCullum 77) there by beating England by eight wickets. The day was great one for WestIndies, After a surprise defeat from Ireland, they recovered and trashed Pakistan with a 150 runs victory. Batting first, WI took a massive 310 runs for the loss of 6 wickets. Ramdin and Simmons took half tonns and Russel took 42 out of 13 balls. In reply Pakistan started batting with a disastrous beginning. They lost their 4 wickets while taking the first runs of their innings. West Indies bowled really well and the Pak lineup trumbled to a mere 160 runs. They were all out for 160 runs in 39 overs. Due to heavy rains the match was abandoned without a ball bowled. Afghans batted first and scored a pretty decent total of 232 runs. Asghar Stanikzai scored 54 runs of 57 balls and Samiullah Shenwari took 38 out of 70 balls . Afghanistan were all out for 232 in 49.4 overs. In reply Sri Lanka batted a received early blows when they lose 2 wickets while completing 50 runs. Mahela Jayawardene batted patiently and scored 100 runs in 148 balls, At a points the match was slipping out of Srilanks hands, but Jaywardane along with Thisara and Angelo Mathews lead SL to the victory stand. They took 236 in 48.2 overs with a loss of 6 wickets. Yet another day of victory for the defending Champions. Indians displayed an amazing all round performance in this match against strong South Africans.This is the first time India beating South Africa in a World cup match. India batted first and scored 307 runs in 50 overs with a loss of 7 wickets. Shikar Dhawan scored 137 of 146 balls. Rahane took 79 and Kohli took 46. In reply SA batted and were all out for 177 in 40.2 overs.F du Plessis scored 55. Ashwin took 3 wickets giving 41 runs. England bat first and set a huge target of 304 for Scotland. With the all round performance by Moeen who scored 128 runs and also took 2 Scottish wickets, England beat Scotland by 119 runs. In reply to England's 303 runs Scotland could score only 184 runs and they were all out in 42.2 overs. A great day for West indians, they bat first and scored 372 runs for the loss of 2 wickets in 50 overs. Chris gayle was the star of the day. He scored 215 runs and become the top scorer in the world cup cricket history. He got support from Samuels who scored 133 runs and was not out. In reply Zimbabwe played well but periodically lost all their wickets for 44.3 overs. The target score of 373 was reduced to 363 in 48 overs as per D/L Method. UAE bat first and set a target of 279 for Ireland. UAE scored 298 for loss of 9 wickets in 50 overs, in which Shaiman Anwar scored 106 runs. In reply Ireland responded well and the match had a nail biting end as Ireland crossed USE score of 278 in 49.2 overs with a loss of 8 wickets. Wilson (80) and kevin o'brien (50) scored fifties for Ireland. Click here to watch Ed Joyce Bowled off but not out video. Agfhanistan won the toss and sent Scotland for battng, They bat for 50 overs and were all out for 210 runs, Tenth scotish wicket fall was in the last ball of their innings. In reply with 3 balls and 1 wicket left Afghanistan crossed Scotlands total. Shenwari scored 96 runs and Javed Ahmadi added 51 runs to the total. In the day 13th of the ICC the World Cup, Sri Lanka did their best . Dilshan and Sangakkarawas amazing their bats and scored tonnes, they scored unbeaten centuries that set up a 92-run win over Bangladesh at the MCG. Bangla boys were all out for 240 runs in 47 overs in which Sabbir took 53 runs well supported by Shakib who scored 46 runs. Srilanks pacer malinga took 3 Bangla wickets for 35 runs. Great day for South Africans.de Villiers scored the fastest 150 in ODIs, and the highest team total on Australian soil, an astonishing 408. West Indians couldn't do much against this huge target, they were all out for 151 in 33.1 overs. This day was dedicated to bowlers. With McCullum's 50 and Williamson unbeaten 45 Kiwi's won the match for one wicket. With Joe Root's hundred England set a target of 310 for SL. SL chased the 309 score and with aloss of one wicket won the match.Kumar Sangakkara scored hundred from 70 balls. Sangakkara and Thirimanne added 212 for the second wicket in 28.2 overs. .
Wahab and Irfan destroyed Zimbabwe's hope for victory by taking 4 wickets each. Amla and du Plessis hundreds helped SA of score a massive 411 for four wickets, in reply Ireland was all out for 210 in 45 overs and SA won by 201 runs. With Shehzad, Sohail and Misbah's fifties pakistans scored a massive total of 339. in reply UAE could score 210 in 50 overs for loss of 8 wickets. Scotland's dream of winning their first WC match was trashed by the amazing batting performance from Tamim, Mahmudullah and Shakib. With Coetzer's 156 Scotland set a target of 319 to win for bangladesh. Bangla scored 322 in 48.1 over to win the match by 6 wickets.